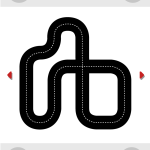 I want to make a 2 player game that can be played using a single iPad. The idea is to have the players racing on a track on the middle of the playing area – a bit like in the arcade classic Slick & Slide. 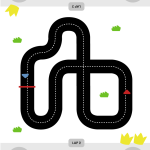 The cars have a constant speed and the only thing the players have to do is steer the vehicle in the direction of the track, by pressing down RIGHT or LEFT buttons. 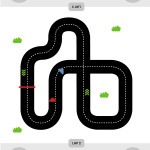 If the player leaves the track, the car speed slows down considerably. 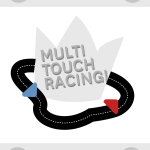 When a player wins a race he or she receives a crown. 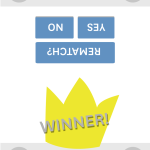 When a player has 3 crowns, they win the game! The loser is given the opportunity to challenge the winner to a rematch. Loser gets to challenge a rematch!